Heat oven to 350°F (325°F for dark or nonstick pan). Spray bottom only of 13x9-inch pan with baking spray with flour. Place paper baking cup in 1 regular-size muffin cup. Make cake batter as directed on box. In small bowl, place 1/2 cup batter; stir in red food color. In another small bowl, place 1/2 cup batter; stir in blue food color. Fill muffin cup 2/3 full with white batter; set aside. Pour remaining white batter into 13x9-inch pan. Randomly drop generous teaspoonfuls of red and blue batters over white batter in pan. For swirled design, cut through batters with knife in S-shaped curves in one continuous motion; turn pan one-fourth turn and repeat. Place muffin pan and cake pan in oven. Bake muffin cup 12 to 13 minutes or until toothpick inserted in center comes out clean; place pan on cooling rack. Continue baking 13x9-inch cake 14 to 18 minutes longer or until toothpick inserted in center comes out clean. Cool cake in pan 10 minutes. Remove cake and cupcake from pans to cooling rack. Cool completely, about 1 hour. Reserve 2 tablespoons frosting. Frost cake with remaining frosting. In upper left-hand corner of cake, lightly score 5x3 1/2-inch rectangle in frosting for blue area of flag; sprinkle with blue sugar. Cut 2 strips of clean white paper, 13 inches long and 1 1/2 inches wide. Cut a third strip, 8 inches long and 1 1/2 inches wide. Place strips lightly on cake to cover area for white stripes. Sprinkle red sugar on cake for red stripes. Remove paper strips. Top blue sugar with candy stars. Frost cupcake with reserved frosting; place in center of cake. Arrange candles in and around cupcake. Store loosely covered. The star candies are available on www.shopbakersnook.com. 4th of July is almost here and your backyard bash is right on track. Guest list- check. Food: check. Drinks: check. Decorations: Ummm….not so much. What to do? If you’ve got less than an hour to spare before guests arrive and all of your party budget has somehow disappeared, don’t despair! You can have a stylish, festive table that will wow your guests and keep your stress level low. These ideas utilize basic materials that you will most likely have on hand—no need to run out for red, white and blue bunting. Look no further than your backyard for a “floral” arrangement. Even during this time of year, when little is in bloom (at least in our yard), inspiration abounds. I gathered our most attractive weeds, and in the process, was happy to stumble upon some tiny wild strawberries that added a punch of color. Mason jars work nicely as vases (I happened to have some on hand for that big fruit canning project that never happened last summer). Leave on the outer ring lid for a metallic touch, and use leftover ribbon to tie around the top for a dash of color. Spread out a roll of kraft paper for a “tablecloth” that will protect your table as well as add visual interest. Use red, white or blue painter’s tape (or all three!) to secure it in place. And to make a memento of the night, put out crayons or markers so your guests can doodle. Grab a couple of pieces of printer paper (the thicker the better) and cut out star-like shapes to adorn the table. I say “star-like” because you don’t need to worry about perfection here: An “abstract” star is more charming than a perfectly symmetrical one. If you’ve got a kids’ table to set as well, consider using spare change as part of your tablescape. Kids will love collecting the coins (just make sure you have a roll of pennies to help even out any rivalries), and they get a history lesson in the process, using the presidents on the coins as a jumping-off point. If you’re looking to give your little ones a task, ask them to draw a quick portrait of your guests. This not only makes a cute keepsake, but the drawings can also be used to indicate seating arrangements. What's a table without a feast? 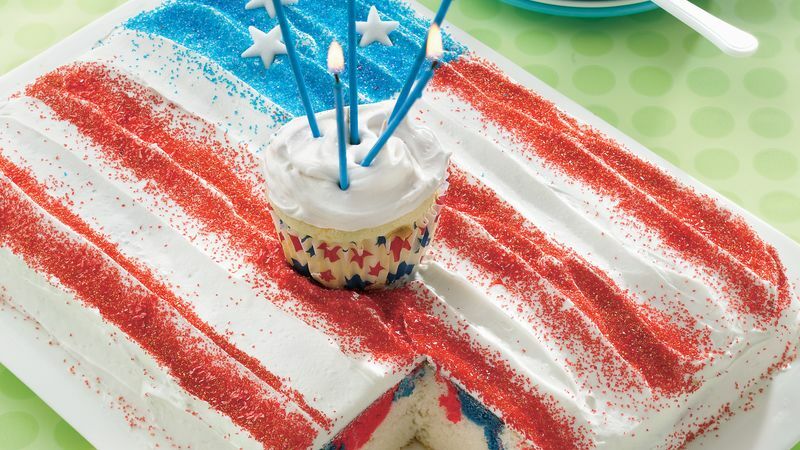 Check out these crowd-pleasing 4th of July treats to top off your bash!